and first place costume prizes. I have never really been a huge Halloween girl. But when I became a mom, it was different. It was all fun all the time- and I literally sewed, crafted, glued and pasted their costumes each year. so you can imagine how some of those costumes turned out. There was the spider, and the rooster, a seal, pumpkins and Raggedy Ann to name a few. And I had a moment. Do you remember Home Improvement? We loved it and the boys loved Al and Tim. 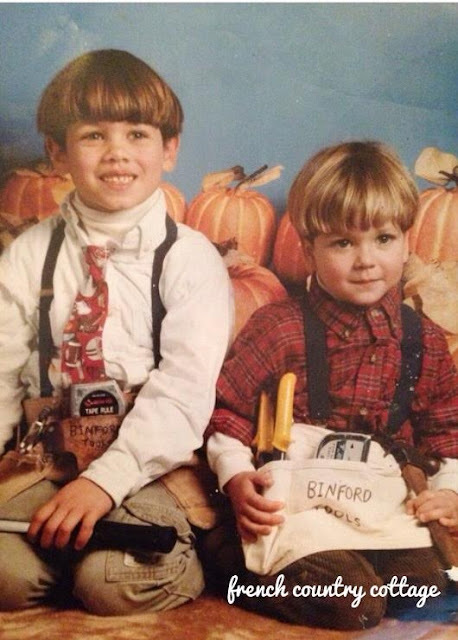 Cutest little handy guys ever. 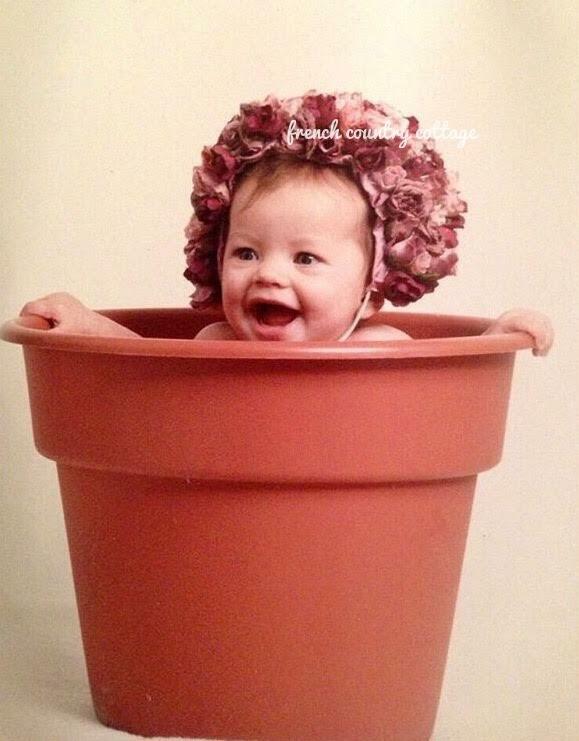 So I hot glued flowers to a baby hat and put her in a big old pot and carried her around. because I was a flower farmer. And it was a moment. as tears welled in my eyes. They didn't want the blue ribbons- they just wanted the candy. and being out late at night with friends and that blue ribbon costume contest. And yes, there were haunted houses with slightly spooky things sometimes. and fun side of Halloween in mind. 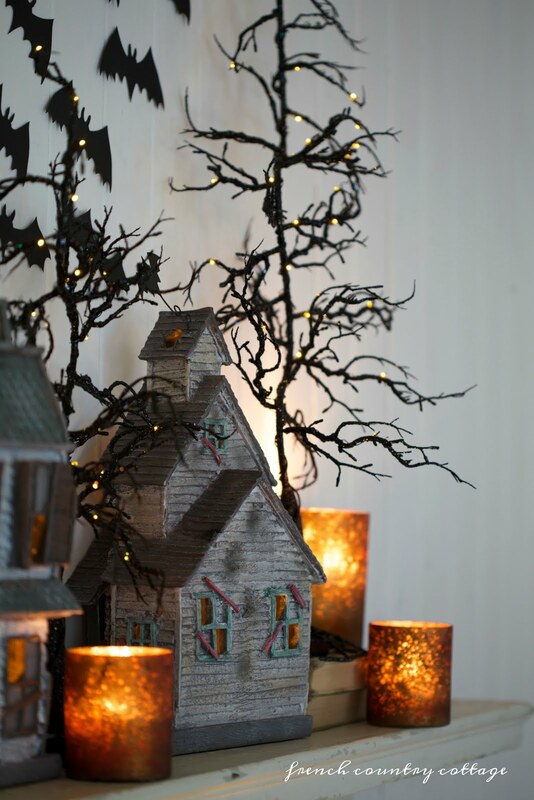 twinkling trees and flickering candles. and pretty little mercury glass candle holders. and those chunky wax drip candles lit the firebox. 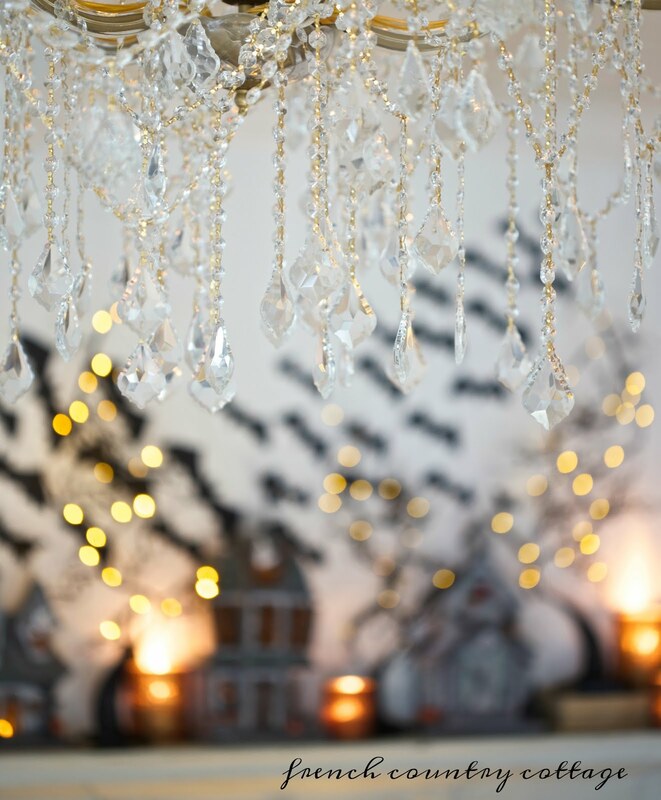 with no tricks and all treats as the lights glow through the windows. 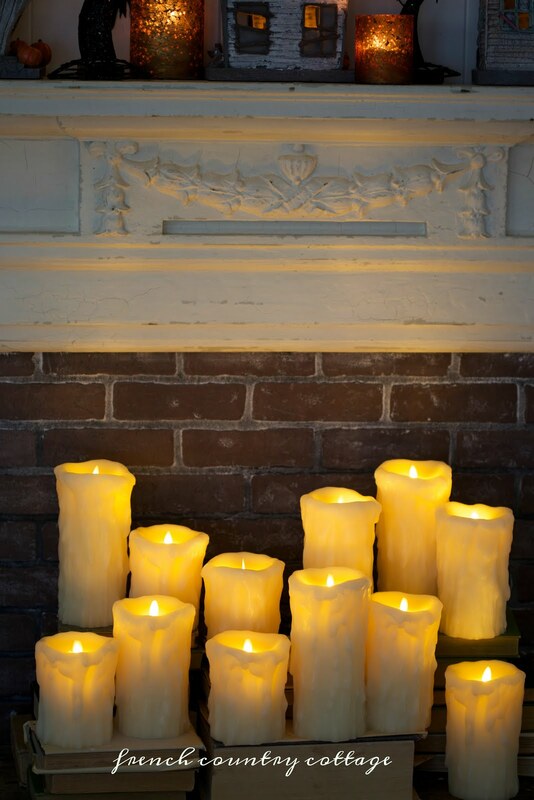 and leave them and enjoy without the worry of a real candle causing a fire. and they look completely realistic. and love that the little windows are on each side. without any of the scary. 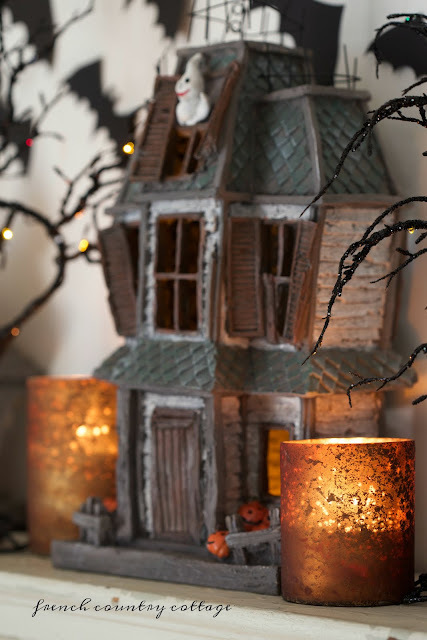 I had a ton of fun channeling my inner Haunted Mansion loving girl and playing with these Halloween pieces from Balsam Hill. and they are all on sale this week too- so win-win. and see what they chose to decorate with as well. And just leave me a note that you did. so I will be adding the entries in the widget to those here for those who are having a problem. 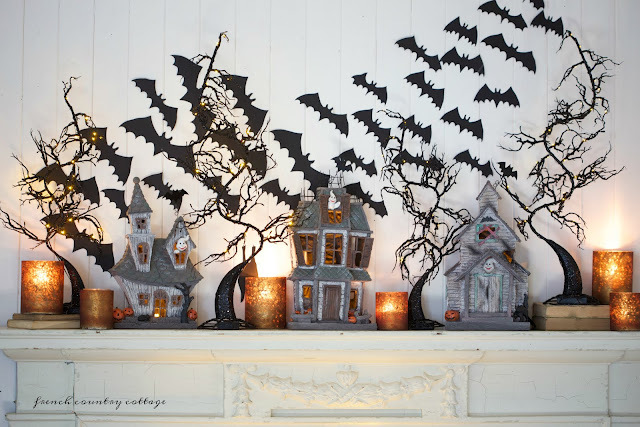 and have a little Halloween party. and those cute little Al and Tim & flower pot costumes are my own. Oh, dear, that little flower is just scrumptious! The Home Improvement guys are cute too, but it's hard to compete with a baby. Halloween is just starting to take off in France. A couple of people in our village decorate a lot but just for the day. It isn't a weeks-long thing like in the U.S. I have been big on homemade costumes, and one won first prize--a headless kid. It really was horrifying. The next year we got hold of latex and did a zippered face, but it wasn't cool to win two years in a row. But it was very fun to pick out a great costume and work on it together. Oh yes, your post brings back a host of memories. Staying up late at night making costumes were some fun times for our three sons. Toy soldiers, raggedy Andy, The Gremlin, clowns, cowboys, etc. Great memories! Our grand-kids still like to get out those old costumes and play with them. Thanks for the trip down memory lane! Baby in a pot! We loved watching Home Improvement, fun series and your boys are so cute! 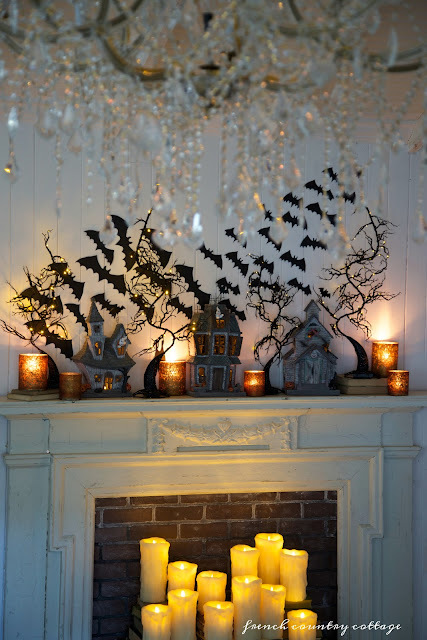 I love your Halloween mantel, especially the bats, a fun spookyness:). Yes, I would love to hear about the Mickey Ds fries story! 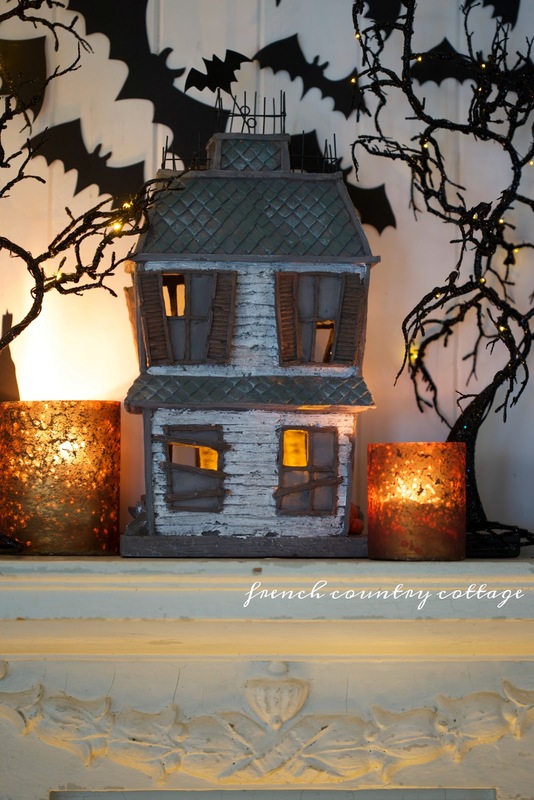 No kiddos yet but I've started to add some Halloween fun with small touches - candy corn and a small copper jack-o-lantern. They make me smile. Hopefully I'll have some little ones to dress up one day. :) My favorite costume was Dorothy and my little brother as the scarecrow. As I have gotten older, I find myself just wanting to do the pretty pumpkin thing and all the beautiful fall colors with a little coastal thrown in. So...I let my fair skinned brunette girl decorate her room with my Halloween decor. That is kinda her thing because she is all Pastel goth and bohemian! She is going to have fun with the bats, ghosts, and a few cute witches! Love Balsam Hill. Thank you Courtney for your beautiful blog! Even though I'm a seaside girl, I love anything French!! Your costumes are wonderful. Well done. I love the Halloween cottages too. Precious. Oh what a wonderful story!.....The treasured memories...I can just envision you carrying the flower pot!...Love, love the mantel...and those drippy candles are the best! 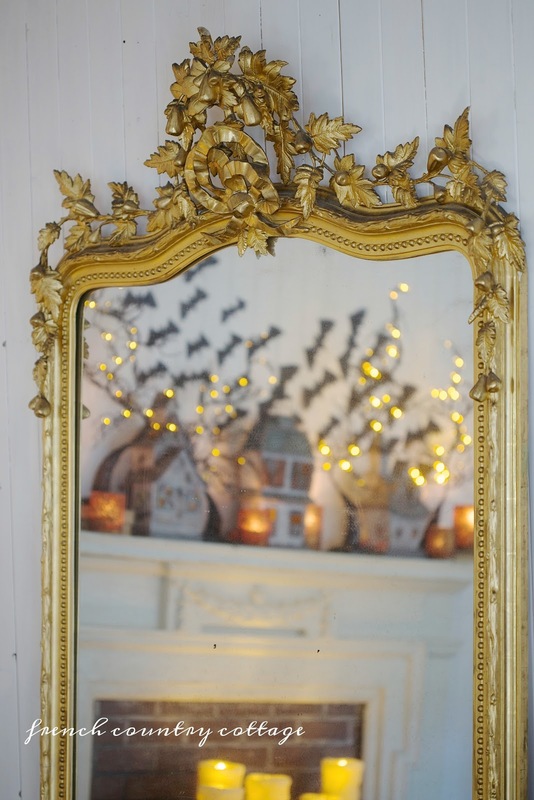 You do Creepy Halloween so elegantly! Courtney I'm DYING over those cute costumes!!! Brilliant!! I'm loving your Halloween mantel and hearth! It's lovely and enchanting! Well-done! Beautiful simple mantel, I love your styling, such an inspiration always! I remember those Anne Geddes babies! Halloween was so much fun as a child. I hope one day I have kids of my own to share the fun with! your homemade outfits are too cute!! I used to make my kids outfits also. one year they were all pumpkins they all wore orange and I did the iron on appliqué and paint embellishments. 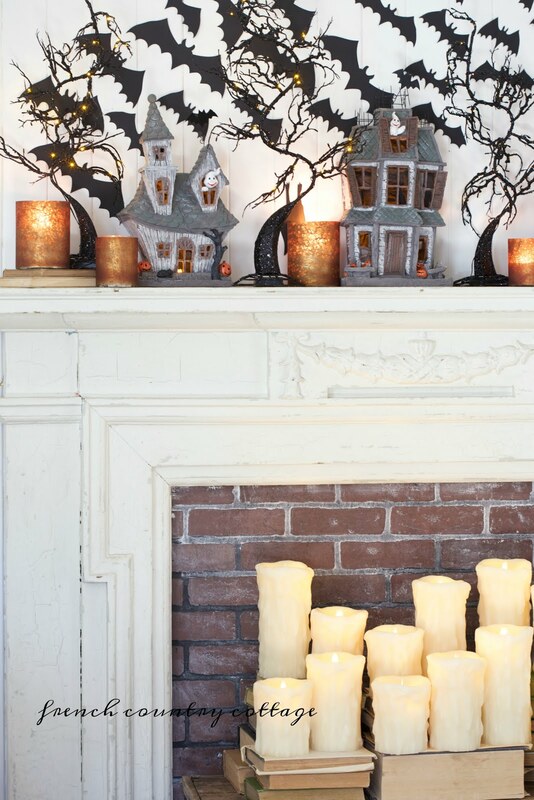 Love the mantel and the houses,too cute. 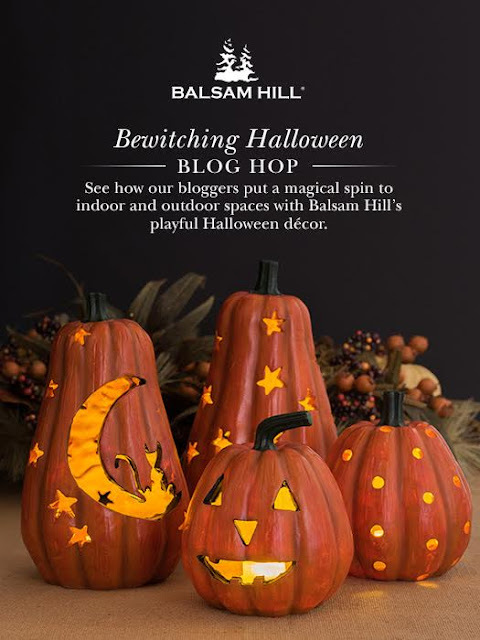 I love Balsam Hill and have ordered a couple of times from them. Very fast delivery. That little village is wonderful. 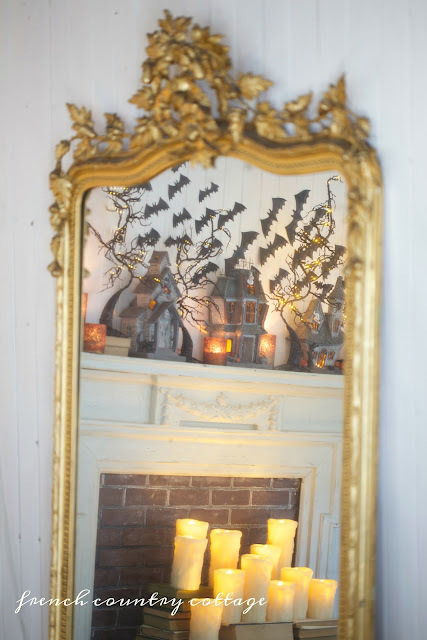 Love your mantel... and your blog. Thanks for the giveaway! I subscribed and shared on Facebook! I was just remembering the year my eldest won his classroom costume contest in a very last minute, thrown together, pirate costume (long before Jack Sparrow!) Your story reminded me of the puffed-up chest feeling of being an award-winning costume designer. A wonderful feeling indeed!! Love your site and thank you for the giveaway! 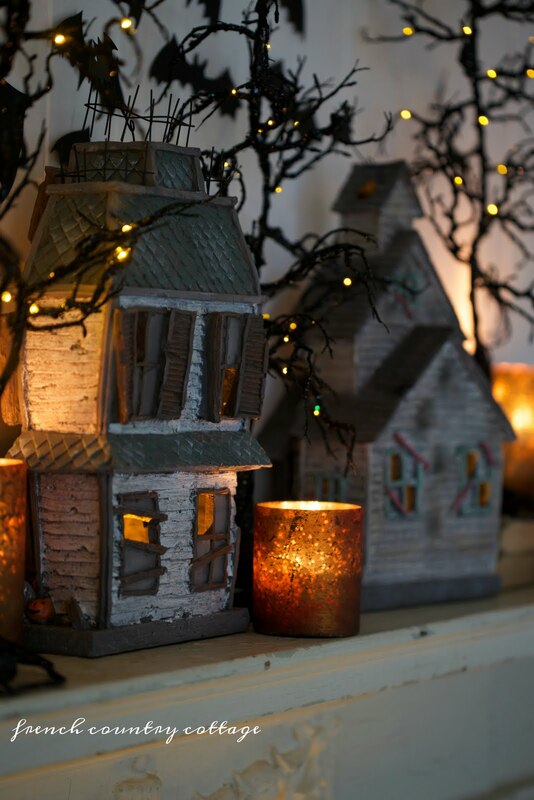 I absolutely love the houses and the way you have them on the mantle. 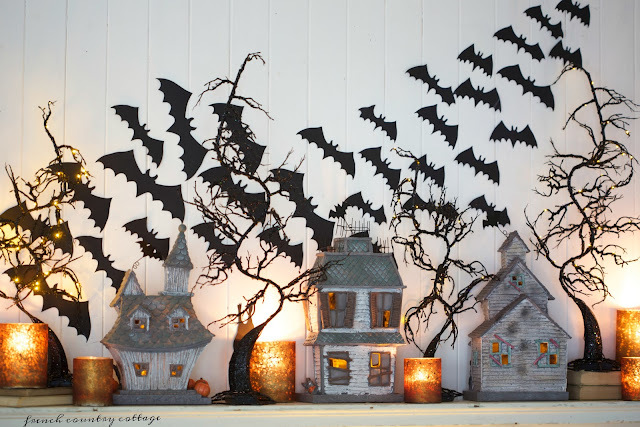 Especially with the bats flying behind! !